Flood frequency analysis uses historical flow records to both estimate the frequency with which floods of a certain magnitude may occur and predict the possible flood magnitude over a certain time period. This module offers a thorough introduction to appropriately constructing the necessary historical data series, calculating the flooding probabilities, and gauging the reliability of the resulting probability values. Methods for assessing flood frequency in basins with limited data are also discussed. Just amazing and very helpful. The clarity of the sentences and the visuality are very well thus letting us understand the topic easily and effectively. Thank you! Very good lesson with one slight calculation issue. Flood Frequency Analysis is very important for flood. I got a lot of knowledge. Highly knowledge packed,very clearly explained,enjoyed the content. 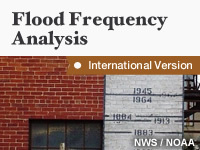 Flood Frequency Analysis, Analysis of Flood Data and statistical Representation of Floods. Flood Data Analysis - it helps in collection and study the data of past period and arriving for Flood Probability and Flood Frequency. - Botcha Sandhya (DEE)-(Gauging sub-division-2(Srikakulam). Difficult concepts explained in simple steps. Excellent. The lessons enhance my understanding to the topics. The concept of exceedance probability, statistical representation of floods, annual and partial duration series of floods, design events etc are explained pretty well. This module simplifies the various terms used in unit hydrograph.